A Manchester City ball boy who was told he would never walk again after being diagnosed with cancer has returned to Etihad pitch for the first time, following a special meeting with Pep Guardiola and Sergio Aguero. Elliott Fernadez-Sanz, aged 19 from Denton, spent nine years as a ball boy with the Blues before being given a sudden diagnosis of sarcoma cancer, which left him on life-support and just three hours from death. Elliott, who has always been a huge Manchester City fan, is proud to have played a pivotal role in the Club’s famous 2012 Premier League winning fixture against QPR, when he placed the ball on the corner spot ahead of Edin Dzeko’s equalizer. 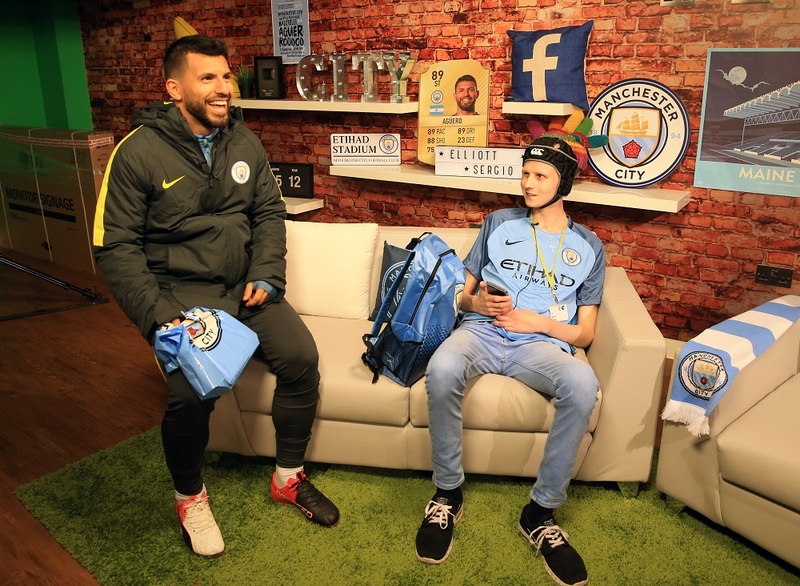 Working with The Willow Foundation, which grants wishes for seriously ill young adults, the Club was delighted to invite Elliott to the City Football Academy where he was able to watch his heroes in training and spend some time with Sergio Aguero. Hearing about the teenager’s story, Manchester City Manager Pep Guardiola also dropped in for a surprise visit where the pair reminisced about their ball boy experiences. The Everton fixture last weekend was the first time Elliott could return to the Etihad on foot and, to celebrate, he was taken onto the pitch at half-time where he was reunited with old friends. Elliott said: “It’s so important for me to go to the games, I really enjoy coming with my family. For me, it’s important to keep going – you can never keep me away from the Etihad! Manchester City is proud to work with a number of wish-granting charities throughout the year. This season, the Club’s foundation City in the Community is celebrating 30 years of making a difference to the lives of people in Manchester. Copyright credits to Manchester City FC. It’s so important for me to go to the games, I really enjoy coming with my family. For me, it’s important to keep going – you can never keep me away from the Etihad!